I clipped a variation of this recipe out of a newspaper (don’t know which one) so many years ago that the clipping has yellowed with age. There is tiny print at the bottom that says the recipe is from Bev Bennett, Tribune Media Services. I’ve made several changes to the original recipe. The original says to make flank steak wraps – slice the steak and put it into flour tortillas or pita bread. I like it better just as straight up steak because then I can use my carb choices for the meal to have some Southwestern Potato Wedges. What’s steak without some potatoes? I also use cilantro instead of Italian parsley and I add more garlic. I’ve used both sirloin steak and flank steak successfully. This recipe is a bit high in fat, but it’s mostly “good” fat coming primarily from the avocado and olive oil. It’s a good source of Protein, Vitamin K, Niacin, Vitamin B6 and Selenium. Season steak on both sides with half of the salt and half of the pepper. Broil or grill until steak is done to your liking, about 5 minutes per side for medium-rare. While the steak is cooking, combine olive oil, vinegar, lemon juice, cilantro, shallots, garlic and remaining salt and pepper in a bowl. Blend well, then gently stir in avocado. Let steak rest for about 5 minutes before slicing across the grain. 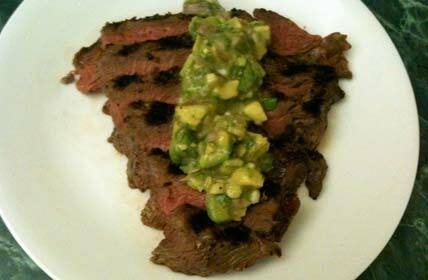 Top steak slices with avocado sauce and serve. I never can get enough avocado and cilantro. This looks delicious. Yum, I love steak with avocado!